Board member, Chrissy, introduced us to this delicious way to serve up tofu for a high-protein and veggie-filled breakfast. This recipe, originally found on the Minimalist Baker, has a wonderful spice mixture that gives the dish a southwest flavor. We added more veggies, of course! Pat tofu dry and wrap in a clean towel with something heavy on top, like a cast iron pot, for about 15 minutes. While tofu is draining, prepare the sauce by adding the dry spices (sea salt, garlic powder, cumin, chili powder, and turmeric) together in a small bowl and stirring in enough water to make a sauce that you can pour. Set sauce aside. 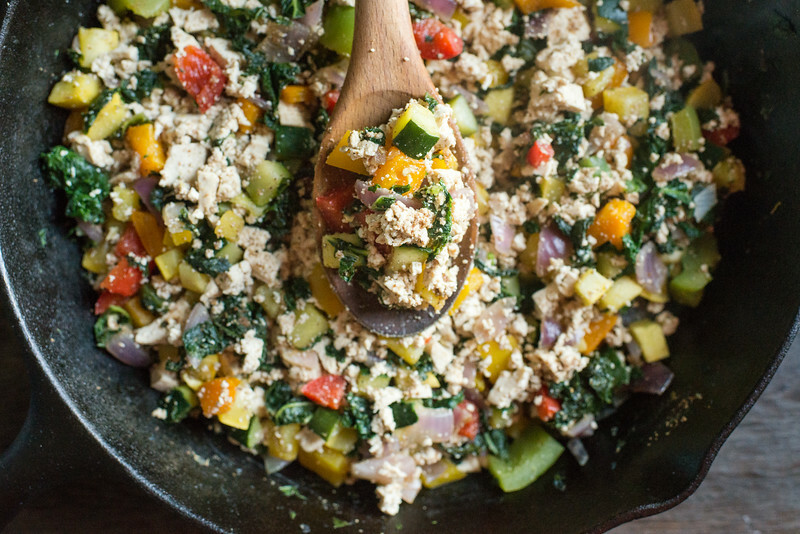 Chop all the veggies and heat 1-2 tablespoons of olive oil in a large skillet. Add onion, bell pepper, squash, zucchini, garlic, salt & pepper and saute until soft. Add kale to the pan and cover to steam - about 2 minutes. Add additional salt & pepper to taste. Move veggies over to one side of the pan. Unwrap tofu and crumble with a fork into bite size pieces. Add to the empty side of the pan with an additional drizzle of olive oil. Saute for 2 minutes, turning to brown slightly. Add sauce, mostly on top of the tofu, but a little bit on the veggies. Stir everything together to evenly distribute sauce and cook an additional 5-7 minutes until lightly browned. Serve with breakfast potatoes, toast, or fruit. This is a great way to introduce some texture using soft tofu and softened vegetables. If your eater is brand new, consider pureeing a bit at first and leaving more texture as they get more practice.